MDA is looking for summer camp volunteers! Volunteering at MDA Summer Camp will enrich your life and inspire you in ways you never dreamed possible. You will help kids, who live with life limiting muscle diseases, discover new interests, build self-confidence and experience the independence of being away from home in a safe environment where barriers don’t exist. The comprehensive training by long time caregivers and medical staff specialized in neurodevelopment is a great enhancement for your résumé when applying for scholarships, college, graduate school, employment, etc. You will develop important leadership skills while simultaneously giving back to your community. Camp also provides a remarkable opportunity for volunteers to meet new people, build lifelong friendships with fellow counselors and create lasting memories for children living with muscle-debilitating diseases. The Muscular Dystrophy Association has been building bridges and knocking down barriers for youngsters with neuromuscular disease since 1955 by providing an unforgettable weeklong summer camp at no cost to their family and no cost to our volunteers (food and lodging is taken care of for the week). Camp is a very magical place where year-round skills are developed and where a child with a disability can just be a kid and we are excited you want to be a part of MDA camp! You would be applying to attend camp as a volunteer for the entire week of June 24th– July 1st 2017. Please note that we’ll be holding the counselor training at camp on the afternoon/evening of June 24th, and it is mandatory for all counselors and volunteers. The Western Washington MDA summer camp is held at YMCA Camp Seymour located at 9725 Cramer Road KPN, Gig Harbor, WA 98329. The MDA summer camp volunteer process includes a completed camp application, an interview with an MDA staff member, a reference check, a criminal background check, a completed physical by your medical professional (within the past 12 months), immunization records and a copy (front and back) of your medical insurance card. 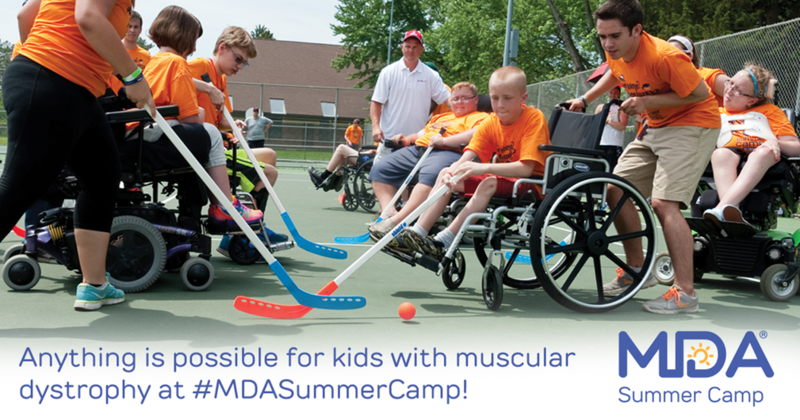 * MDA has summer camps all over the country for kids 6 – 17 with muscular dystrophy and other neuromuscular diseases. Interested in volunteering at an MDA Summer Camp outside of Western Washington or want more information on MDA summer camps in general? See what MDA Summer Camp is all about summer camp page on mda.org and find the local MDA office to contact – https://www.mda.org/services/mda-summer-camp. As a 19-year old college sophomore at UW I went into MDA Camp thinking I wanted to be a doctor and was hopeful to gain some hands-on experience. Through the direct care and relationships I had, I became a home caregiver for the next few years after and changed my focus to nursing because of the connection gained through being “at the bedside.” As I applied for my first job, having my years at MDA Camp stood out in my resume, bringing up much discussion in my interview for my dream job! I now have been working as a nurse for almost 4 years in the PCU, and this will be my 10th year at camp this June, my 4th year as one of the volunteer nurses. Camp is something hard to explain to those who have never been, but through it I have learned so much and met some of the most incredible campers and volunteers. I can’t imagine my summer without it! The most amazing part about volunteering at MDA Summer Camp is being a part of something that means so much to the kids. The first day of camp, kids show up so unbelievably excited. The second camp ends, they’re already counting down the days until next summer. This is one week where their disability takes a back seat and they can just be a kid, making friends, having fun and just feeling good. As a volunteer, you get to be a part of stories they’ll tell for years and help build memories they’ll cherish for the rest of their lives. It’s an incredible gift and lesson to witness the strength and joy of campers despite the daily obstacles and grim realities they face. This entry was posted in Employment/Internship, General Interest, Occupational Therapy, Physical Therapy, Physician Assistant, Premedical, Prenursing, Public Health, Summer Program. Bookmark the permalink.